Indicate by check mark whether the Registrant (1) has filed all reports required to be filed by Section 13 or 15(d) of the Securities Exchange Act of 1934 during the preceding twelve months (or for such shorter period that the Registrant was required to file such reports) and (2) has been subject to such requirements for the past 90 days. YES x NO ¨. Indicate by check mark whether the registrant has submitted electronically and posted on its corporate Web site, if any, every Interactive Data File required to be submitted and posted pursuant to Rule 405 of Regulation S-T (§232.405 of this chapter) during the preceding 12 months (or for such shorter period that the registrant was required to submit and post such files). YES ¨ NO ¨. As of December 7, 2010, there were 16,980,900 shares issued and 13,250,290 shares outstanding of the Registrants Common Stock. The aggregate market value of the voting and non-voting common equity held by non-affiliates of the Registrant, computed by reference to the last sale price on March 31, 2010, was $152,294,061. 1. Proxy Statement for the 2010 Annual Meeting of Stockholders of the Registrant (Part III). This Annual Report contains certain forward-looking statements which may be identified by the use of words such as believe, expect, anticipate, should, planned, estimated and potential. Examples of forward-looking statements include, but are not limited to, estimates with respect to our financial condition, results of operations and business that are subject to various factors which could cause actual results to differ materially from these estimates and most other statements that are not historical in nature. These factors include, but are not limited to, general and local economic conditions, changes in interest rates, deposit flows, demand for mortgage, and other loans, real estate values, competition, changes in accounting principles, policies, or guidelines, changes in legislation or regulation, and other economic, competitive, governmental, regulatory, and technological factors affecting our operations, pricing products and services. ESSA Bancorp, Inc. is the Pennsylvania-chartered stock holding company of ESSA Bank & Trust. ESSA Bancorp, Inc. owns 100% of the outstanding shares of common stock of ESSA Bank & Trust. Since being formed in 2006, ESSA Bancorp, Inc. has engaged primarily in the business of holding the common stock of ESSA Bank & Trust. Our executive offices are located at 200 Palmer Street, Stroudsburg, Pennsylvania 18360. Our telephone number at this address is (570) 421-0531. ESSA Bancorp, Inc. is subject to comprehensive regulation and examination by the Office of Thrift Supervision. At September 30, 2010, ESSA Bancorp, Inc. had consolidated assets of $1.1 billion, consolidated deposits of $540.4 million and consolidated stockholders equity of $171.6 million. Its consolidated net income for the fiscal year ended September 30, 2010 was $4.5 million. On April 3, 2007, ESSA Bancorp, Inc. consummated its stock offering, resulting in gross proceeds of $158.7 million, through the sale of 15,870,000 shares at a price of $10.00 per share. ESSA Bancorp, Inc. also contributed 1,110,900 shares of its common stock to the ESSA Bank & Trust Foundation along with $1.6 million in cash. Expenses related to the offering were approximately $2.9 million, which resulted in net proceeds of approximately $155.8 million prior to the contribution to the ESSA Bank & Trust Foundation. ESSA Bancorp, Inc. loaned approximately $13.6 million to the ESSA Bank & Trusts Employee Stock Ownership Plan. ESSA Bancorp, Inc. retained approximately $64.3 million of the net proceeds of the offering prior to the contribution to the ESSA Bank & Trust Foundation, and the remainder of the net proceeds were contributed to ESSA Bank & Trust. ESSA Bank & Trust was organized in 1916. ESSA Bank & Trust is a Pennsylvania chartered full-service, community-oriented savings association. We provide financial services to individuals, families and businesses through our seventeen full-service banking offices, located in Monroe, Northampton and Lehigh Counties, Pennsylvania. ESSA Bank & Trust is subject to comprehensive regulation and examination by the Pennsylvania Department of Banking and the Office of Thrift Supervision. ESSA Bank & Trusts business consists primarily of accepting deposits from the general public and investing those deposits, together with funds generated from operations and borrowings, in residential first mortgage loans (including construction mortgage loans), commercial real estate loans, home equity loans and lines of credit, commercial and consumer loans. We offer a variety of deposit accounts, including checking, savings and certificates of deposits. We also offer asset management and trust services. We offer investment services through our relationship with PRIMEVEST Financial Services, Inc., a third party broker/dealer and investment advisor. ESSA Bank & Trusts executive offices are located at 200 Palmer Street, Stroudsburg, Pennsylvania 18360. Our telephone number at this address is (570) 421-0531. Our website address is www.essabank.com. The Company is a public company, and files interim, quarterly and annual reports with the Securities and Exchange Commission (SEC). All filed SEC reports and interim filings can be obtained from the Banks website, on the Investor Relations page, without charge from the Company. At September 30, 2010, our seventeen full-service banking offices consisted of thirteen offices in Monroe County, two offices in Lehigh County, and two offices in Northampton County, Pennsylvania. Our primary market for deposits is currently concentrated around the areas where our full-service banking offices are located. Our primary lending area consists of the counties where our branch offices are located, and to a lesser extent, the contiguous counties in the Commonwealth of Pennsylvania. Monroe County is located in eastern Pennsylvania, situated 90 miles north of Philadelphia, 75 miles west of New York and 116 miles northeast of Harrisburg. Monroe County is comprised of 611 square miles of mostly rural terrain. Major industries include tourism, construction and educational facilities. Northampton County is located south of Monroe County and directly borders New Jersey. Lehigh County is located southwest of Monroe County. As of June 30, 2010, we had a deposit market share of approximately 23.5% in Monroe County, which represented the largest deposit market share in Monroe County and less than 1.0% in Northampton and Lehigh Counties. Historically, our principal lending activity has been the origination of first mortgage loans for the purchase, construction or refinancing of one- to four-family residential real property. During the past five years, we have increased our originations of commercial real estate loans in an effort to increase interest income, diversify our loan portfolio, and better serve the community. These loans have increased from 8.4% of our total loan portfolio at September 30, 2006 to $78.1 million, or 10.6% of our total loan portfolio at September 30, 2010. One- to four-family residential real estate mortgage loans represented $596.2 million, or 80.8%, of our loan portfolio at September 30, 2010. Home equity loans and lines of credit totaled $43.5 million, or 5.9% of our loan portfolio at September 30, 2010. Commercial loans totaled $16.6 million, or 2.2% of our loan portfolio at September 30, 2010 and construction first mortgage loans totaled $1.3 million, or 0.2% of the total loan portfolio at September 30, 2010. We originate other consumer loans on a limited basis. Loan Portfolio Composition. The following table sets forth the composition of our loan portfolio, by type of loan at the dates indicated, excluding loans held for sale. Loan Portfolio Maturities and Yields. The following table summarizes the scheduled repayments of our loan portfolio at September 30, 2010. Demand loans, loans having no stated repayment schedule or maturity, and overdraft loans are reported as being due in one year or less. The following table sets forth the scheduled repayments of fixed- and adjustable-rate loans at September 30, 2010 that are contractually due after September 30, 2011. Loan Originations and Repayments. Historically, we have originated residential mortgage loans pursuant to underwriting standards that generally conform to Fannie Mae and Freddie Mac guidelines. Loan origination activities are primarily concentrated in Monroe, Northampton and Lehigh Counties, Pennsylvania and secondarily from other Pennsylvania counties contiguous to Monroe County. New loans are generated primarily from the efforts of employees and advertising, a network of select mortgage brokers, other parties with whom we do business, customer referrals, and from walk-in customers. Loan applications are underwritten and processed at our corporate center. One- to Four-Family Residential Loans. Historically, our primary lending activity has consisted of the origination of one- to four-family residential mortgage loans secured primarily by properties located in Monroe and Northampton Counties, Pennsylvania. At September 30, 2010, approximately $596.2 million, or 80.8% of our loan portfolio, consisted of one- to four-family residential loans. Our origination of one- to four-family loans decreased in fiscal year 2010 compared to fiscal years 2009 and 2008. Originations in fiscal year 2010 were positively influenced by a significant amount of refinancing activity due to record low mortgage rates. Generally, one- to four-family residential mortgage loans are originated in amounts up to 80% of the lesser of the appraised value or purchase price of the property, although loans may be made with higher loan-to-value ratios at a higher interest rate to compensate for the risk. Private mortgage insurance is generally required on loans with a loan-to-value ratio in excess of 80%. Fixed-rate loans are originated for terms of 10, 15, 20 and 30 years. At September 30, 2010, our largest loan secured by one- to four-family real estate had a principal balance of approximately $771,000 and was secured by a single family house. This loan was performing in accordance with its repayment terms. We also offer adjustable-rate mortgage loans which have fixed terms of one, three, five or seven-years before converting to an annual adjustment schedule based on changes in a designated United States Treasury index. We originated $1.7 million of adjustable rate one- to four-family residential loans during the year ended September 30, 2010 and $5.0 million during the year ended September 30, 2009. Our adjustable rate mortgage loans provide for maximum rate adjustments of 200 basis points per adjustment, with a lifetime maximum adjustment of 500 basis points. Our adjustable rate mortgage loans amortize over terms of up to 30 years. Adjustable rate mortgage loans decrease the risk associated with changes in market interest rates by periodically repricing, but involve other risks because, as interest rates increase, the principal and interest payments on the loan increase, thus increasing the potential for default by the borrower. At the same time, the marketability of the underlying collateral may be adversely affected by higher interest rates. Upward adjustment of the contractual interest rate is also limited by the maximum periodic and lifetime interest rate adjustments, permitted by our loan documents; and therefore, is potentially limited in effectiveness during periods of rapidly rising interest rates. At September 30, 2010, $57.0 million, or 9.6%, of our one- to four-family residential loans had adjustable rates of interest. All one- to four-family residential mortgage loans that we originate include due-on-sale clauses, which give us the right to declare a loan immediately due and payable in the event that, among other things, the borrower sells or otherwise disposes of the real property subject to the mortgage and the loan is not repaid. Regulations limit the amount that a savings association may lend relative to the appraised value of the real estate securing the loan, as determined by an appraisal of the property at the time the loan is originated. For all purchase money loans, we utilize outside independent appraisers approved by the Board of Directors. All purchase money borrowers are required to obtain title insurance. Certain modest refinance requests may utilize an automated valuation model and title search. We also require fire and casualty insurance and, where circumstances warrant, flood insurance. Home Equity Loans and Lines of Credit. Home equity loans and lines of credit are generated almost exclusively by our branch staff. Eligible properties include primary and vacation homes in northeastern Pennsylvania, with the large majority of loans being originated in Monroe County. As of September 30, 2010, home equity loans and lines totaled about $43.5 million, or 5.9% or our loan portfolio. The maximum combined loan-to-value originated is currently 70-80%, depending on the collateral and the holder of the first mortgage. There is a modest portion of the portfolio originated in years past that contains original combined loan-to-values of up to 90%. Our home equity lines of credit typically feature a 10 year draw period with interest-only payments permitted, followed by another 10 years of fully amortizing payments with no further ability to draw funds. Similar combined loan-to-value characteristics and standards exist for the lines as are outlined above for the loans. Loan underwriting standards restrict the size of a junior lien loan to between $100,000 and $200,000, depending on the loan type and collateral. All loans exceeding 70-75% of value require an appraisal by bank-approved, licensed appraisers. Loans with lesser loan-to-value ratios may have utilized either automated valuation models or county tax assessments. Title/lien searches are secured on all home equity loans and lines greater than $25,000. Commercial Real Estate Loans. At September 30, 2010, $78.1 million, or 10.6% of our total loan portfolio consisted of commercial real estate loans. Commercial real estate loans are secured by office buildings, mixed-use properties and other commercial properties. We generally originate adjustable rate commercial real estate loans with an initial term of five years and a repricing option, and a maximum term of up to 25 years. The maximum loan-to-value ratio of our commercial real estate loans is 85%. At September 30, 2010, we had 290 commercial real estate loans with an outstanding balance of $78.1 million. At September 30, 2010, our largest commercial real estate loan balance was $3.7 million, which was performing in accordance with its terms. At September 30, 2010, eight of our loans secured by commercial real estate totaling $1.4 million were not performing in accordance with their terms and were on nonaccrual status. We consider a number of factors in originating commercial real estate loans. We evaluate the qualifications and financial condition of the borrower, including credit history, profitability and expertise, as well as the value and condition of the mortgaged property securing the loan. When evaluating the qualifications of the borrower, we consider the financial resources of the borrower, the borrowers experience in owning or managing similar property and the borrowers payment history with us and other financial institutions. In evaluating the property securing the loan, the factors we consider include the net operating income of the mortgaged property before debt service and depreciation, the ratio of the loan amount to the appraised value of the mortgaged property and the debt service coverage ratio (the ratio of net operating income to debt service) to ensure that it is at least 120% of the monthly debt service. All commercial real estate loans in excess of $250,000 are appraised by outside independent appraisers approved by the Board of Directors. Personal guarantees are obtained from commercial real estate borrowers although we will occasionally consider waiving this requirement based upon the loan-to-value ratio of the proposed loan. All purchase money and asset refinance borrowers are required to obtain title insurance. We also require fire and casualty insurance and, where circumstances warrant, flood insurance. Loans secured by commercial real estate generally are considered to present greater risk than one- to four-family residential loans. Commercial real estate loans often involve large loan balances to single borrowers or groups of related borrowers. Repayment of these loans depends to a large degree on the results of operations and management of the properties securing the loans or the businesses conducted on such property, and may be affected to a greater extent by adverse conditions in the real estate market or the economy in general. Accordingly, the nature of these loans makes them more difficult for management to monitor and evaluate. First Mortgage Construction Loans. At September 30, 2010, $1.3 million, or 0.2%, of our total loan portfolio consisted of first mortgage construction loans. Most of our first mortgage construction loans are for the construction of residential properties. We currently offer fixed and adjustable-rate residential first mortgage construction loans. First mortgage construction loans are generally structured for permanent mortgage financing once the construction is completed. At September 30, 2010, our largest first mortgage construction loan balance was $241,000. The loan was performing in accordance with its terms. First mortgage construction loans, once converted to permanent financing, generally repay over a thirty-year period. First mortgage construction loans require only the payment of interest during the construction period. First mortgage construction loans will generally be made in amounts of up to 80% of the appraised value of the completed property, or the actual cost of the improvements. Funds are disbursed based on our inspections in accordance with a schedule reflecting the completion of portions of the project. First mortgage construction loans generally involve a greater degree of credit risk than one- to four-family residential mortgage loans. The risk of loss on a construction loan depends, in part, upon the accuracy of the initial estimate of the value of the property at completion of construction compared to the estimated cost of construction. For all such loans, we utilize outside independent appraisers approved by the Board of Directors. All borrowers are required to obtain title insurance. We also require fire and casualty insurance and, where circumstances warrant, flood insurance on properties. Other Loans. We offer a variety of loans that are either unsecured or secured by property other than real estate. These loans include loans secured by deposits, personal loans and automobile loans. At September 30, 2010, these other loans totaled $2.5 million, or 0.3% of the total loan portfolio. Loan Approval Procedures and Authority. The loan approval process is intended to assess the borrowers ability to repay the loan, the viability of the loan, and the adequacy of the value of the property that will secure the loan. To assess the borrowers ability to repay, we review each borrowers employment and credit history and information on the historical and projected income and expenses of mortgagors. All residential mortgage loans in excess of the conforming loan limit but not more than $500,000 must be approved by one of the following: President or Chief Lending Officer. All loans in excess of $500,000 but not more than $750,000 must be approved by any two of the following: President, Chief Lending Officer and the Vice President, Branch Administration. All loans in excess of $750,000 to $1.25 million must be approved by the Management Loan Committee. The Management Loan Committee consists of the President, Chief Lending Officer, Vice President, Branch Administration and Vice President, Commercial Lending. All loans in excess of $1.25 million must be approved by the Board of Directors. After a real estate secured loan becomes 15 days late, we deliver a computer generated late charge notice to the borrower and will attempt to contact the borrower by telephone. When a loan becomes 30 days delinquent, we send a delinquency letter to the borrower. We then attempt to make satisfactory arrangements to bring the account current, including interviewing the borrower, until the mortgage is brought current or a determination is made to recommend foreclosure, deed-in-lieu of foreclosure or other appropriate action. After 60 days, we will generally refer the matter to the Board of Directors who may authorize legal counsel to commence foreclosure proceedings. Mortgage loans are reviewed on a regular basis and such loans are placed on non-accrual status when they become more than 90 days delinquent. When loans are placed on non-accrual status, unpaid accrued interest is fully reserved, and further income is recognized only when the loan is no longer a non-accrual loan. Non-performing Loans. At September 30, 2010, $10.9 million (or 1.47% of our total loans) were non-performing loans. The majority of these loans, or $8.7 million, were residential first mortgage loans that were 90 days or more past due or troubled debt restructured loans that were considered non-performing at September 30, 2010. Real Estate Owned. At September 30, 2010, the Company had $2.0 million of real estate owned consisting of eight properties. The majority of the Companys real estate owned consisted of one real estate development project valued at $1.0 million at September 30, 2010. The Company realized a $1.2 million write-down on this development project in December 2009. The write-down was taken to reflect the projects value after an updated appraisal. All these properties are being actively marketed and additional losses may occur. Non-Performing Assets. The table below sets forth the amounts and categories of our non-performing assets at the dates indicated. * Non-performing troubled debt restructurings of $361,000 are included in total troubled debt restructures. For the year ended September 30, 2010, gross interest income that would have been recorded had our non-accruing loans been current in accordance with their original terms was $509,000. Delinquencies. The following table sets forth certain information with respect to our loan portfolio delinquencies at the dates indicated. Loans delinquent for 90 days or more are generally classified as nonaccrual loans. and values, highly questionable and improbable. Assets classified as loss are those considered uncollectible and of such little value that their continuance as assets without the establishment of a specific loss reserve is not warranted. We classify an asset as special mention if the asset has a potential weakness that warrants managements close attention. While such assets are not impaired, management has concluded that if the potential weakness in the asset is not addressed, the value of the asset may deteriorate, thereby adversely affecting the repayment of the asset. On the basis of managements review of its assets, at September 30, 2010, we classified approximately $11.0 million of our assets as special mention, $29.5 million as substandard, $165,000 as doubtful, and none as loss. At September 30, 2009, the Company classified approximately $12.8 million of our assets as special mention, $12.9 million as substandard, $104,000 as doubtful and none as loss. The loan portfolio is reviewed on a regular basis to determine whether any loans require classification in accordance with applicable regulations. Not all classified assets constitute non-performing assets. Our allowance for loan losses is maintained at a level necessary to absorb loan losses that are both probable and reasonably estimable. Management, in determining the allowance for loan losses, considers the losses inherent in its loan portfolio and changes in the nature and volume of loan activities, along with the general economic and real estate market conditions. Our allowance for loan losses consists of two elements: (1) an allocated allowance, which comprises allowances established on specific loans and class allowances based on historical loss experience and current trends, and (2) an unallocated allowance based on general economic conditions and other risk factors in our markets and portfolios. We maintain a loan review system, which allows for a periodic review of our loan portfolio and the early identification of potential impaired loans. Such system takes into consideration, among other things, delinquency status, size of loans, type and market value of collateral and financial condition of the borrowers. Specific loan loss allowances are established for identified losses based on a review of such information. A loan evaluated for impairment is considered to be impaired when, based on current information and events, it is probable that we will be unable to collect all amounts due according to the contractual terms of the loan agreement. All loans identified as impaired are evaluated independently. We do not aggregate such loans for evaluation purposes. Loan impairment is measured based on the fair value of collateral method, taking into account the appraised value, any valuation assumptions used, estimated costs to sell and trends in the market since the appraisal date. General loan loss allowances are based upon a combination of factors including, but not limited to, actual loan loss experience, composition of the loan portfolio, current economic conditions, managements judgment and losses which are probable and reasonably estimable. The allowance is increased through provisions charged against current earnings and recoveries of previously charged-off loans. Loans that are determined to be uncollectible are charged against the allowance. While management uses available information to recognize probable and reasonably estimable loan losses, future loss provisions may be necessary based on changing economic conditions. Payments received on impaired loans generally are either applied against principal or reported as interest income, according to managements judgment as to the collectability of principal. The allowance for loan losses as of September 30, 2010 is maintained at a level that represents managements best estimate of losses inherent in the loan portfolio, and such losses were both probable and reasonably estimable. In addition, the Office of Thrift Supervision and the Pennsylvania Department of Banking, as an integral part of its examination process, periodically review our allowance for loan losses. The banking regulators may require that we recognize additions to the allowance based on its analysis and review of information available to it at the time of its examination. The following table sets forth activity in our allowance for loan losses for the periods indicated. See Non-Performing Loans and Problem Assets. There can be no assurance that we will not experience a deterioration of our loan portfolio, including increases in non-performing loans, problem assets and charge-offs, in the future. Allocation of Allowance for Loan Losses. The following tables set forth the allowance for loan losses allocated by loan category, the percent of the allowance to the total allowance and the percent of loans in each category to total loans at the dates indicated. The allowance for loan losses allocated to each category is not necessarily indicative of future losses in any particular category and does not restrict the use of the allowance to absorb losses in other categories. We use the accrual method of accounting for all performing loans. The accrual of interest income is generally discontinued when the contractual payment of principal or interest has become 90 days past due or management has serious doubts about further collectibility of principal or interest, even though the loan is currently performing. When a loan is placed on nonaccrual status, unpaid interest previously credited to income is reversed. Interest received on nonaccrual loans generally is either applied against principal or reported as interest income, according to managements judgment as to the collectibility of principal. Generally, residential and consumer loans are restored to accrual status when the obligation is brought current in accordance with the contractual terms for a reasonable period of time and ultimate collectibility of total contractual principal and interest is no longer in doubt. Commercial loans are restored to accrual status when the obligation is brought current, has performed in accordance with the contractual terms for a reasonable period of time and ultimate collectibility of total contractual principal and interest no longer is in doubt. In our collection efforts, we will first attempt to cure any delinquent loan. If a real estate secured loan is placed on nonaccrual status, it will be subject to transfer to the real estate owned (REO) portfolio (properties acquired by or in lieu of foreclosure), upon which our loan servicing department will pursue the sale of the real estate. Prior to this transfer, the loan balance will be reduced, if necessary, to reflect its current market value less estimated costs to sell. Write downs of REO that occur after the initial transfer from the loan portfolio and costs of holding the property are recorded as other operating expenses, except for significant improvements which are capitalized to the extent that the carrying value does not exceed estimated net realizable value. Fair values for determining the value of collateral are estimated from various sources, such as real estate appraisals, financial statements and from any other reliable sources of available information. For those loans deemed to be impaired, collateral value is reduced for the estimated costs to sell. Reductions of collateral value are based on historical loss experience, current market data, and any other source of reliable information specific to the collateral. This analysis process is inherently subjective, as it requires us to make estimates that are susceptible to revisions as more information becomes available. Although we believe that we have established the allowance at levels to absorb probable and estimable losses, future additions may be necessary if economic or other conditions in the future differ from the current environment. Our securities investment policy is established by our Board of Directors. This policy dictates that investment decisions be made based on the safety of the investment, liquidity requirements, potential returns, cash flow targets, and consistency with our interest rate risk management strategy. Our investment policy is reviewed annually by our ALCO/Investment management committee. All policy changes recommended by this management committee must be approved by the Board of Directors. The Committee is comprised of the Chief Executive Officer, Chief Financial Officer, Controller, Lending Services Division Manager, Retail Services Division Manager and the Delivery Systems Division Manager. Authority to make investments under the approved guidelines is delegated by the Committee to appropriate officers. While general investment strategies are developed and authorized by the ALCO/Investment management committee, the execution of specific actions rests with the Chief Financial Officer. The approved investment officers are authorized to execute investment transactions up to $5.0 million per transaction without the prior approval of the ALCO/Investment management committee and within the scope of the established investment policy. These officers are also authorized to execute investment transactions between $5.0 million and $10.0 million with the additional approval from the Chief Executive Officer. Each transaction in excess of $10.0 million must receive prior approval of the ALCO/Investment Committee. investments in mortgage-backed securities, including pass-through securities issued and guaranteed by Fannie Mae, Freddie Mac and Government National Mortgage Association (GNMA) as well as commercial paper, corporate debt and municipal securities. Our current investment strategy uses a risk management approach of diversified investing in fixed-rate securities with short- to intermediate-term maturities, as well as adjustable-rate securities, which may have a longer term to maturity. The emphasis of this approach is to increase overall investment securities yields while managing interest rate risk. At the time of purchase, we designate a security as held to maturity, available-for-sale, or trading, depending on our ability and intent. Securities available-for-sale are reported at fair value, while securities held to maturity are reported at amortized cost. Mortgage-Backed Securities. We purchase mortgage-backed securities in order to generate positive interest rate spreads with minimal administrative expense, lower credit risk as a result of the guarantees provided by Freddie Mac, Fannie Mae and GNMA and increased liquidity. We invest primarily in mortgage-backed securities issued or sponsored by Fannie Mae, Freddie Mac, and GNMA. At September 30, 2010, our mortgage-backed securities portfolio had a fair value of $187.3 million, consisting of Freddie Mac, Fannie Mae and GNMA mortgage-backed securities. Mortgage-backed securities are created by pooling mortgages and issuing a security collateralized by the pool of mortgages with an interest rate that is less than the interest rate on the underlying mortgages. Mortgage-backed securities typically represent a participation interest in a pool of single-family or multi-family mortgages, although most of our mortgage-backed securities are collateralized by single-family mortgages. The issuers of such securities (generally U.S. government agencies and U.S. government sponsored enterprises, including Fannie Mae, Freddie Mac and GNMA) pool and resell the participation interests in the form of securities to investors, such as ESSA Bank & Trust, and guarantee the payment of principal and interest to these investors. Investments in mortgage-backed securities involve a risk that actual prepayments will be greater or less than the prepayment rate estimated at the time of purchase, which may require adjustments to the amortization of any premium or accretion of any discount relating to such instruments, thereby affecting the net yield on such securities. We review prepayment estimates for our mortgage-backed securities at the time of purchase to ensure that prepayment assumptions are reasonable considering the underlying collateral for the securities at issue and current interest rates, and to determine the yield and estimated maturity of the mortgage-backed securities portfolio. Periodic reviews of current prepayment speeds are performed in order to ascertain whether prepayment estimates require modification that would cause amortization or accretion adjustments. Equity Securities. At September 30, 2010, our equity securities were minimal. In addition, we hold FHLBank Pittsburgh (FHLB) common stock to qualify for membership in the Federal Home Loan Bank System and to be eligible to borrow funds under the FHLB advance program. There is no market for the common stock. The aggregate fair value of our FHLB common stock as of September 30, 2010 was $20.7 million based on its par value. No unrealized gains or losses have been recorded because we have determined that the par value of the common stock represents its fair value. We owned shares of FHLB common stock at September 30, 2010 with a par value that was $5.9 million more than we were required to own to maintain our membership in the Federal Home Loan Bank System and to be eligible to obtain advances. We are required to purchase additional stock as our outstanding advances increase. Any excess stock we own was redeemed monthly by the FHLB. On December 23, 2008, the FHLB notified its members, including the Company, that it was suspending the payment of dividends on its capital stock and the repurchase of excess capital stock until further notice. We review equity and debt securities with significant declines in fair value on a periodic basis to determine whether they should be considered temporarily or other than temporarily impaired. If a decline in the fair value of a security is determined to be other than temporary, we are required to reduce the carrying value of the security to its fair value and record a non-cash, credit related impairment charge in the amount of the decline, net of tax effect, against our current income. Our investment securities portfolio contains unrealized losses on securities, including mortgage-related instruments issued or backed by the full faith and credit of the United States government, or generally viewed as having the implied guarantee of the United States government, and debt obligations of a State or political subdivision. Our policy is to recognize an other-than-temporary impairment of equity securities where the fair value has been significantly below cost for four consecutive quarters. For fixed maturity investments with unrealized losses due to interest rates where the Company does not intend to sell the security and it is more likely than not that the Company will not be required to sell the security before its anticipated recovery in market value, declines in value below cost are not assumed to be other than temporary. We review our position quarterly and concluded that at September 30, 2010, declines included in the table below represent temporary declines due to interest rate change, and we do not intend to sell those securities and it more likely than not that we will not have to sell those securities before their anticipated recovery in market value. The following table sets forth the composition of our securities portfolio (excluding FHLBank Pittsburgh common stock) at the dates indicated. Portfolio Maturities and Yields. The composition and maturities of the investment securities portfolio at September 30, 2010 are summarized in the following table. Maturities are based on the final contractual payment dates, and do not reflect the impact of prepayments or early redemptions that may occur. General. Deposits, borrowings, repayments and prepayments of loans and securities, proceeds from maturing securities and cash flows from operations are the primary sources of our funds for use in lending, investing and for other general purposes. Deposits. We offer a variety of deposit accounts with a range of interest rates and terms. Our deposit accounts consist of savings accounts, NOW accounts, checking accounts, money market accounts, club accounts, certificates of deposit and IRAs and other qualified plan accounts. We provide commercial checking accounts for businesses. At September 30, 2010, our deposits totaled $540.4 million. Interest-bearing NOW, savings and club and money market deposits totaled $248.9 million at September 30, 2010. At September 30, 2010, we had a total of $261.1 million in certificates of deposit. Noninterest-bearing demand deposits totaled $30.4 million. Although we have a significant portion of our deposits in shorter-term certificates of deposit, we monitor activity on these accounts and, based on historical experience and our current pricing strategy, we believe we will retain a large portion of these accounts upon maturity. Our deposits are obtained predominantly from the areas in which our branch offices are located. We rely on our favorable locations, customer service and competitive pricing to attract and retain these deposits. While we accept certificates of deposit in excess of $100,000 for which we may provide preferential rates, we generally do not solicit such deposits as they are more difficult to retain than core deposits. At September 30, 2010, we had a total of $70.6 million of brokered certificates of deposits, an increase of $48.7 million from the prior fiscal year end. Our brokered certificates of deposits range from one- to six-year terms, and are purchased only through pre-approved brokers. The following table sets forth the distribution of average deposit accounts, by account type, at the dates indicated. As of September 30, 2010, the aggregate amount of outstanding certificates of deposit in amounts greater than or equal to $100,000 was approximately $182.1 million. The following table sets forth the maturity of those certificates as of September 30, 2010. At September 30, 2010, $93.9 million of our certificates of deposit had maturities of one year or less. We monitor activity on these accounts and, based on historical experience and our current pricing strategy, we believe we will retain a significant portion of these accounts upon maturity. Borrowings. Our short-term borrowings consist of Federal Home Loan Bank and Federal Reserve Bank advances. The following table sets forth information concerning balances and interest rates on all of our short-term borrowings at the dates and for the years indicated. At September 30, 2010, we had the ability to borrow approximately $496 million under our credit facilities with the FHLBank Pittsburgh. We face significant competition in both originating loans and attracting deposits. The counties in which we operate have a significant concentration of financial institutions, many of which are significantly larger institutions and have greater financial resources than we, and many of which are our competitors to varying degrees. Our competition for loans comes principally from commercial banks, savings banks, mortgage banking companies, credit unions, leasing companies, insurance companies and other financial service companies. Our most direct competition for deposits has historically come from commercial banks, savings banks and credit unions. We face additional competition for deposits from nondepository competitors such as the mutual fund industry, securities and brokerage firms and insurance companies. We seek to meet this competition by the convenience of our branch locations, emphasizing personalized banking and the advantage of local decision-making in our banking business. Specifically, we promote and maintain relationships and build customer loyalty within local communities by focusing our marketing and community involvement on the specific needs of individual neighborhoods. As of June 30, 2010, ESSA Bank & Trust had the largest deposit market share in Monroe County, Pennsylvania. We do not rely on any individual, group, or entity for a material portion of our deposits. As of September 30, 2010, we had 187 full-time employees and 37 part-time employees. The employees are not represented by a collective bargaining unit and we consider our relationship with our employees to be good. ESSA Bank & Trust has two wholly owned subsidiaries, ESSACOR, Inc. and Pocono Investment Company. ESSACOR, Inc. is a Pennsylvania corporation that is currently inactive. Pocono Investment Company is a Delaware corporation formed as an investment company subsidiary to hold and manage certain investments of ESSA Bank & Trust, including certain intellectual property. ESSA Bancorp, Inc. is a Pennsylvania corporation. As a savings and loan holding company, we are required to file certain reports with, and otherwise comply with the rules and regulations of the Office of Thrift Supervision. ESSA Bank & Trust is a Pennsylvania-chartered savings association and its deposit accounts are insured up to applicable limits by the Federal Deposit Insurance Corporation under the Deposit Insurance Fund (DIF). We are subject to extensive regulation by the Pennsylvania Department of Banking, our chartering agency, and by the Office of Thrift Supervision, our primary federal regulator. We must file reports with the Pennsylvania Department of Banking and the Office of Thrift Supervision concerning our activities and financial condition in addition to obtaining regulatory approvals prior to entering into certain transactions including, but not limited to, mergers with or acquisitions of other savings institutions. There are periodic examinations by the Pennsylvania Department of Banking and the Office of Thrift Supervision to test our compliance with various regulatory requirements. This regulation and supervision establishes a comprehensive framework of activities in which an institution can engage and is intended primarily for the protection of the Federal Deposit Insurance Corporation insurance fund and depositors. The regulatory structure also gives the regulatory authorities extensive discretion in connection with their supervisory and enforcement activities and with their examination policies, including policies with respect to the classification of assets and the establishment of adequate loan loss reserves for regulatory purposes. Any change in such regulation, whether by the Pennsylvania Department of Banking or the Office of Thrift Supervision could have a material adverse impact on us and our operations. The Pennsylvania Savings Association Code of 1967, as amended (the Savings Association Code) contains detailed provisions governing the organization, location of offices, rights and responsibilities of directors, officers, employees, and depositors, as well as corporate powers, savings and investment operations and other aspects of ESSA Bank & Trust and its affairs. The Savings Association Code delegates extensive rulemaking power and administrative discretion to the Pennsylvania Department of Banking so that the supervision and regulation of state-chartered savings associations may be flexible and readily responsive to changes in economic conditions and in savings and lending practices. One of the purposes of the Savings Association Code is to provide savings associations with the opportunity to be competitive with each other and with other financial institutions existing under other Pennsylvania laws as well as other state, federal and foreign laws. A Pennsylvania savings association may locate or change the location of its principal place of business and establish an office anywhere in Pennsylvania, with the prior approval of the Pennsylvania Department of Banking. The Pennsylvania Department of Banking generally examines each savings association not less frequently than once every two years. Although the Department may accept the examinations and reports of the Office of Thrift Supervision in lieu of the Departments examination, the current practice is for the Department to conduct individual examinations. The Department may order any savings association to discontinue any violation of law or unsafe or unsound business practice and may direct any trustee, officer, attorney, or employee of a savings association engaged in an objectionable activity, after the Department has ordered the activity to be terminated, to show cause at a hearing before the Department why such person should not be removed. establishes standards for safety and soundness. The Office of Thrift Supervision generally examines each savings association not less frequently than once every two years. The Office of Thrift Supervision has the authority to order any savings association or its directors, trustees, officers, attorneys or employees to discontinue any violation of law or unsafe or unsound banking practice. Sections 23A and 23B of the Federal Reserve Act and its implementing regulations govern transactions between depository institutions and their affiliates. These provisions are made applicable to savings associations, such as ESSA Bank & Trust, by the Home Owners Loan Act and Office of Thrift Supervision regulation. In a holding company context, the parent holding company of a savings association and any companies that are controlled by the parent holding company are affiliates of the savings association. Section 23A limits the extent to which a savings association or its subsidiaries may engage in certain transactions with its affiliates. These transactions include, among other things, the making of loans or other extensions of credit to an affiliate and the purchase of assets from an affiliate. Generally, these transactions between the savings association and any one affiliate cannot exceed 10% of the savings associations capital stock and surplus, and these transactions between the savings institution and all of its affiliates cannot, in the aggregate, exceed 20% of the savings institutions capital stock and surplus. Section 23A also establishes specific collateral requirements for loans or extensions of credit to an affiliate, and for guarantees or acceptances on letters of credit issued on behalf of an affiliate. Applicable regulations prohibit a savings association from lending to any affiliate engaged in activities not permissible for a bank holding company or for the purpose of acquiring the securities of most affiliates. Section 23B requires that transactions covered by Section 23A and a broad list of other specified transactions be on terms and under circumstances substantially the same, or no less favorable to the savings association or its subsidiary, as similar transactions with non-affiliates. In addition to the restrictions on transactions with affiliates that Sections 23A and 23B of the Federal Reserve Act impose on depository institutions, the regulations of the Office of Thrift Supervision also generally prohibit a savings association from purchasing or investing in securities issued by an affiliate. Deposit accounts in ESSA Bank & Trust are insured by the Federal Deposit Insurance Corporation (FDIC) generally up to a maximum of $250,000 per separately insured depositor and up to a maximum of $250,000 for self-directed retirement accounts. ESSA Bank & Trusts deposits, therefore, are subject to FDIC deposit insurance assessments. The FDIC has adopted a temporary Transaction Account Guarantee (TAG) Program that provides unlimited insurance coverage for all non-interest bearing transaction accounts, including NOW accounts and IOLTA accounts. This temporary TAG program is scheduled to expire on December 31, 2010. In connection with the passage of the Dodd-Frank Act, the FDIC has adopted a new rule that provides full insurance coverage for all non-interest bearing transaction accounts, except NOW accounts and IOLTA accounts. The new rule becomes effective December 31, 2010 for a two-year period. As a result of this new rule, the FDIC has decided not to extend the coverage of its TAG program. The Federal Deposit Insurance Corporation regulations assess insurance premiums based on an institutions risk. Under this assessment system, the Federal Deposit Insurance Corporation evaluates the risk of each financial institution based on its supervisory rating, financial ratios, and long-term debt issuer rating. The rates for nearly all of the financial institutions industry vary between five and seven cents for every $100 of domestic deposits. Federal law requires the Federal Deposit Insurance Corporation to establish a deposit reserve ratio for the deposit insurance fund of between 1.15% and 1.50% of estimated deposits. On November 9, 2010, the Federal Deposit Insurance Corporation published a notice of a proposed rulemaking under the Dodd-Frank Wall Street Reform and Consumer Protection Act (Dodd-Frank Act) to reform the deposit insurance assessment system. The proposal would redefine the assessment base used for calculating deposit insurance assessments. Specifically, the rule would base assessments on an institutions total assets as opposed to total deposits. The proposal is expected to benefit smaller financial institutions, which typically rely more on deposits for funding, and shift more of the burden for supporting the insurance fund to larger institutions, which have greater access to non-deposit sources of funding. There are no assurances when the Federal Deposit Insurance Corporation will issue a final rule reforming the deposit insurance assessment system and what that final rule may ultimately provide. In addition to the Federal Deposit Insurance Corporation assessments, the Financing Corporation (FICO) is authorized to impose and collect, with the approval of the Federal Deposit Insurance Corporation, assessments for anticipated payments, issuance costs and custodial fees on bonds issued by the FICO in the 1980s to recapitalize the Federal Savings and Loan Insurance Corporation. The bonds issued by the FICO are due to mature in 2017 through 2019. For the quarter ended June 30, 2010, the annualized FICO assessment was equal to 1.04 basis points for each $100 in domestic deposits maintained at an institution. Recent failures have significantly increased the Deposit Insurance Funds (the DIF or the fund) loss provisions, resulting in a decline in the reserve ratio. Because the fund reserve ratio has fallen below 1.15% and is expected to remain below 1.15%, the FDIC is required to establish and implement a restoration plan to restore the reserve ratio to 1.15%. Absent extraordinary circumstances, the reserve ratio must be returned to at least 1.15% no later than five years after establishment of the plan. On May 22, 2009, the FDIC adopted a final rule levying a five basis point special assessment on each insured depository institutions assets minus Tier 1 capital as of June 30, 2009. The special assessment was payable on September 30, 2009. We recorded an expense of $400,000 during the quarter ended June 30, 2009 to reflect the special assessment. On September 20, 2009, the FDIC increased assessment rates on deposit insurance premiums by three basis points effective January 1, 2011. In addition, on November 12, 2009, the FDIC issued a final rule requiring all insured depository institutions to prepay their estimated assessments for the fourth quarter of 2009, and for all of 2010, 2011 and 2012, on December 30, 2009. Under the terms of the new rule, we made a payment of $1.7 million to the FDIC on December 30, 2009. We recorded the payment as a prepaid expense, which will be amortized to expense over three years. Any savings institution that fails any of the capital requirements is subject to possible enforcement actions by the Office of Thrift Supervision. Such actions could include a capital directive, a cease and desist order, civil money penalties, the establishment of restrictions on an institutions operations, termination of federal deposit insurance, and the appointment of a conservator or receiver. Certain actions are required by law. The Office of Thrift Supervisions capital regulation provides that such actions, through enforcement proceedings or otherwise, could require one or more of a variety of corrective actions. We are also subject to more stringent capital guidelines of the Pennsylvania Department of Banking. Although not adopted in regulation form, the Pennsylvania Department of Banking utilizes capital standards of 6% leverage capital and 10% risk-based capital. The components of leverage and risk-based capital are substantially the same as those defined by the Office of Thrift Supervision. Under federal regulations, with certain limited exceptions, a Pennsylvania chartered savings association may lend to a single or related group of borrowers on an unsecured basis an amount equal to 15% of its unimpaired capital and surplus. An additional amount, equal to 10% of unimpaired capital and surplus, may be lent if such loan is secured by readily marketable collateral, which is defined to include certain securities, but generally does not include real estate. Our internal policy, however, is to not make a commercial loan in excess of $5.0 million, nor to allow more than $7.5 million in total loan relationships with any one borrower, including the borrowers residential mortgage and consumer loans. However, in special circumstances this limit may be exceeded subject to the approval of the Management Loan Committee in addition to a majority of the members of the Board of Directors. Under federal regulations, a savings association is deemed to be (i) well capitalized if it has total risk-based capital of 10.0% or more, has a Tier 1 risk-based capital ratio of 6.0% or more, has a Tier I leverage capital ratio of 5.0% or more and is not subject to any written capital order or directive; (ii) adequately capitalized if it has a total risk-based capital ratio of 8.0% or more, a Tier I risk-based capital ratio of 4.0% or more and a Tier I leverage capital ratio of 4.0% or more (3.0% under certain circumstances) and does not meet the definition of well capitalized; (iii) undercapitalized if it has a total risk-based capital ratio that is less than 8.0%, a Tier I risk-based capital ratio that is less than 4.0% or a Tier I leverage capital ratio that is less than 4.0% (3.0% under certain circumstances); (iv) significantly undercapitalized if it has a total risk-based capital ratio that is less than 6.0%, a Tier I risk-based capital ratio that is less than 3.0% or a Tier I leverage capital ratio that is less than 3.0%; and (v) critically undercapitalized if it has a ratio of tangible equity to total assets that is equal to or less than 2.0%. Federal regulations also specify circumstances under which a federal banking agency may reclassify a well capitalized institution as adequately capitalized and may require an adequately capitalized institution to comply with supervisory actions as if it were in the next lower category (except that the Office of Thrift Supervision may not reclassify a significantly undercapitalized institution as critically undercapitalized). As of September 30, 2010, the Bank was a well-capitalized institution for this purpose. The USA PATRIOT Act of 2001 gave the federal government new powers to address terrorist threats through enhanced domestic security measures, expanded surveillance powers, increased information sharing and broadened anti-money laundering requirements. The USA PATRIOT Act also required the federal banking agencies to take into consideration the effectiveness of controls designed to combat money laundering activities in determining whether to approve a merger or other acquisition application of a member institution. Accordingly, if we engage in a merger or other acquisition, our controls designed to combat money laundering would be considered as part of the application process. We have established policies, procedures and systems designed to comply with these regulations. ESSA Bancorp, Inc. is a unitary savings and loan holding company, subject to regulation and supervision by the Office of Thrift Supervision. The Office of Thrift Supervision will have enforcement authority over ESSA Bancorp, Inc. and its non-savings institution subsidiaries. Among other things, this authority permits the Office of Thrift Supervision to restrict or prohibit activities that are determined to be a risk to ESSA Bank & Trust. Under prior law, a unitary savings and loan holding company generally had no regulatory restrictions on the types of business activities in which it could engage, provided that its subsidiary savings association was a qualified thrift lender. The Gramm-Leach-Bliley Act of 1999, however, restricts unitary savings and loan holding companies not existing on, or applied for before, May 4, 1999 to those activities permissible for financial holding companies or for multiple savings and loan holding companies. The Company is not a grandfathered unitary savings and loan holding company and, therefore, is limited to the activities permissible for financial holding companies or for multiple savings and loan holding companies. A financial holding company may engage in activities that are financial in nature, including underwriting equity securities and insurance as well as activities that are incidental to financial activities or complementary to a financial activity. A multiple savings and loan holding company is generally limited to activities permissible for bank holding companies under Section 4(c)(8) of the Bank Holding Company Act, subject to the prior approval of the Office of Thrift Supervision, and certain additional activities authorized by Office of Thrift Supervision regulations. Federal law prohibits a savings and loan holding company, directly or indirectly, or through one or more subsidiaries, from acquiring control of another savings institution or holding company thereof, without prior written approval of the Office of Thrift Supervision. It also prohibits the acquisition or retention of, with specified exceptions, more than 5% of the equity securities of a company engaged in activities that are not closely related to banking or financial in nature or acquiring or retaining control of an institution that is not federally insured. In evaluating applications by holding companies to acquire savings institutions, the Office of Thrift Supervision must consider the financial and managerial resources and future prospects of the savings institution involved, the effect of the acquisition on the risk to the insurance fund, the convenience and needs of the community, the effectiveness of each parties anti-money laundering program, and competitive factors. Shares of ESSA Bancorp, Inc.s common stock are registered with the SEC under Section 12(b) of the Securities Exchange Act of 1934, as amended (the Exchange Act). ESSA Bancorp, Inc. is also subject to the proxy rules, tender offer rules, insider trading restrictions, annual and periodic reporting, and other requirements of the Exchange Act. The Sarbanes-Oxley Act of 2002 was enacted in response to public concerns regarding corporate accountability in connection with certain accounting scandals. The stated goals of the Sarbanes-Oxley Act are to increase corporate responsibility, to provide for enhanced penalties for accounting and auditing improprieties at publicly traded companies, and to protect investors by improving the accuracy and reliability of corporate disclosures pursuant to the securities laws. The Sarbanes-Oxley Act generally applies to all companies that file or are required to file periodic reports with the Securities and Exchange Commission, under the Securities Exchange Act of 1934. The Sarbanes-Oxley Act includes specific additional disclosure requirements, requires the Securities and Exchange Commission and national securities exchanges to adopt extensive additional disclosure, corporate governance and other related rules, and mandates further studies of certain issues by the Securities and Exchange Commission. The Sarbanes-Oxley Act represents significant federal involvement in matters traditionally left to state regulatory systems, such as the regulation of the accounting profession, and to corporate law, such as the relationship between a board of directors and management and between a board of directors and its committees. Although we have and will continue to incur additional expense in complying with the provisions of the Sarbanes-Oxley Act and the resulting regulations, management does not expect that such compliance will have a material impact on our results of operations or financial condition. Federal law provides federal banking regulators with substantial enforcement powers. This enforcement authority includes, among other things, the ability to assess civil money penalties, to issue cease-and-desist or removal orders, and to initiate injunctive actions against banking organizations and institution-affiliated parties, as defined. In general, these enforcement actions may be initiated for violations of laws and regulations and unsafe or unsound practices. Other actions or inactions may provide the basis for enforcement action, including misleading or untimely reports filed with regulatory authorities. Our ability to pay dividends depends, to a large extent, upon ESSA Bank & Trusts ability to pay dividends to ESSA Bancorp. The Savings Association Code states, in part, that dividends may be declared and paid by the Bank only out of net earnings for the then current year. A dividend may not be declared or paid if it would impair the general reserves of ESSA Bank & Trust required to be maintained under the Savings Association Code. In addition, we are required to notify the Office of Thrift Supervision prior to declaring a dividend to the Company, and receive the nonobjection of the Office of Thrift Supervision to any such dividend. Profound legislative and regulatory changes in banking, and the regulation of banks, savings associations, and other financial institutions as well as bank holding companies and thrift holding companies powers are likely as a result of the passage and signing into law, in July 2010, of the Dodd-Frank Act. This new legislation calls for sweeping regulatory and supervisory reforms for the entire financial sector and seeks to advance the following five key objectives: (i) promote robust supervision and regulation of financial firms, (ii) establish comprehensive supervision of financial markets, (iii) protect consumers and investors from financial abuse, (iv) provide the government with additional powers to monitor systemic risks, supervise and regulate financial products and markets, and to resolve firms that threaten financial stability, and (v) raise international regulatory standards and improve international cooperation. The Dodd-Frank Act also includes the creation of a new federal bureau within the Federal Reserve designed to enforce consumer protection laws. The Consumer Financial Protection Bureau (CFPB) will have authority to protect consumers of financial products and services and to regulate all providers (bank and non-bank) of such services. The CFPB will be authorized to adopt rules for all providers of consumer financial services, supervise and examine such institutions for compliance, and enforce compliance through orders, fines, and penalties. The rules of the CFPB will serve as a floor and individual states would be permitted to adopt and enforce stronger consumer protection laws. As a result of this new legislation, we may become subject to multiple laws affecting our provision of loans and other credit services to consumers, which may substantially increase the cost of providing such services. Additionally, the Dodd-Frank Act establishes the Financial Stability Oversight Council, which will focus on identifying, monitoring and addressing systemic risks in the financial system and reorganize bank supervision by identifying clear lines of regulatory responsibility for the FDIC, the OCC and the Federal Reserve. The effect of this legislation is likely to include a requirement for increased capital and liquidity undertakings on the part of regulated financial institutions, as well as greater oversight over market and business practices that we and these firms may implement. Finally, the Dodd-Frank Act eliminated the Office of Thrift Supervision and requires it to be merged into the Office of the Comptroller of the Currency, the regulator of the national bank system. As a result of the elimination of the Office of Thrift Supervision, which is not expected to occur before July 2011, ESSA Bancorp, Inc. will be regulated by the Federal Reserve Board and ESSA Bank & Trust will be regulated by the Office of the FDIC, as its primary federal banking regulator, and the Pennsylvania Department of Banking. General. ESSA Bancorp, Inc. and ESSA Bank & Trust are subject to federal income taxation in the same general manner as other corporations, with some exceptions discussed below. The following discussion of federal taxation is intended only to summarize material federal income tax matters and is not a comprehensive description of the tax rules applicable to ESSA Bancorp, Inc. and ESSA Bank & Trust. Method of Accounting. For federal income tax purposes, ESSA Bancorp, Inc. currently reports its income and expenses on the accrual method of accounting and uses a tax year ending September 30th for filing its consolidated federal income tax returns. The Small Business Protection Act of 1996 eliminated the use of the reserve method of accounting for bad debt reserves by savings institutions, effective for taxable years beginning after 1995. Bad Debt Reserves. Prior to the Small Business Protection Act of 1996, ESSA Bank & Trust was permitted to establish a reserve for bad debts for tax purposes and to make annual additions to the reserve. These additions could, within specified formula limits, be deducted in arriving at ESSA Bank & Trusts taxable income. As a result of the Small Business Protection Act of 1996, ESSA Bank & Trust must use the specific charge off method in computing its bad debt deduction for tax purposes. Taxable Distributions and Recapture. Prior to the Small Business Protection Act of 1996, bad debt reserves created prior to 1988 were subject to recapture into taxable income if ESSA Bank & Trust failed to meet certain thrift asset and definition tests. The Small Business Protection Act of 1996 eliminated these thrift-related recapture rules. However, under current law, pre-1988 reserves remain subject to tax recapture should ESSA Bank & Trust make certain distributions from its tax bad debt reserve or cease to maintain a financial institution charter. At September 30, 2010, ESSA Bank & Trusts total federal pre-1988 reserve was approximately $4.3 million. This reserve reflects the cumulative effects of federal tax deductions by ESSA Bank & Trust for which no federal income tax provision has been made. Minimum Tax. The Internal Revenue Code of 1986, as amended, imposes an alternative minimum tax at a rate of 20% on a base of regular taxable income plus certain tax preferences, referred to as alternative minimum taxable income. The alternative minimum tax is payable to the extent alternative minimum tax income is in excess of the regular income tax. Net operating losses can, in general, offset no more than 90% of alternative minimum taxable income. Certain payments of alternative minimum tax may be used as credits against regular tax liabilities in future years. At September 30, 2010, ESSA Bank & Trust had no minimum tax credit carryforward. Net Operating Loss Carryovers. A financial institution may carry back net operating losses to the preceding two taxable years (five years for losses incurred in 2001, 2002 and 2009) and forward to the succeeding 20 taxable years. At September 30, 2010, ESSA Bank & Trust had no net operating loss carryforward for federal income tax purposes. Corporate Dividends. We may exclude from our income 100% of dividends received from ESSA Bank & Trust as a member of the same affiliated group of corporations. Audit of Tax Returns. ESSA Bank & Trusts federal income tax returns have not been audited in the most recent five-year period. The 2006, 2007, 2008 and 2009 tax years remain open. Pennsylvania State Taxation. ESSA Bancorp, Inc. is subject to the Pennsylvania Corporate Net Income Tax, Capital Stock and Franchise Tax. The Corporation Net Income Tax rate for fiscal year 2010 is 9.9% and is imposed on unconsolidated taxable income for federal purposes with certain adjustments. In general, the Capital Stock and Franchise Tax is a property tax imposed on a corporations capital stock value at a statutorily defined rate, such value being determined in accordance with a fixed formula based upon average net income and net worth. ESSA Bank & Trust is subject to tax under the Pennsylvania Mutual Thrift Institutions Tax Act, as amended to include thrift institutions having capital stock. Pursuant to the Mutual Thrift Institutions Tax, the tax rate is 11.5%. The Mutual Thrift Institutions Tax exempts ESSA Bank & Trust from other taxes imposed by the Commonwealth of Pennsylvania for state income tax purposes and from all local taxation imposed by political subdivisions, except taxes on real estate and real estate transfers. The Mutual Thrift Institutions Tax is a tax upon net earnings, determined in accordance with generally accepted accounting principles with certain adjustments. The Mutual Thrift Institutions Tax, in computing income according to generally accepted accounting principles, allows for the deduction of interest earned on state and federal obligations, while disallowing a percentage of thrifts interest expense deduction in the proportion of interest income on those securities to the overall interest income of ESSA Bank & Trust. Net operating losses, if any, thereafter can be carried forward three years for Mutual Thrift Institutions Tax purposes. Financial reform legislation recently enacted will, among other things, change our holding company and bank regulators, create a new Consumer Financial Protection Bureau, tighten capital standards and result in new laws and regulations that are expected to increase our costs of operations. On July 21, 2010 the President signed the Dodd-Frank Wall Street Reform and Consumer Protection Act (the Dodd-Frank Act). This new law will significantly change the current bank regulatory structure and affect the lending, deposit, investment, trading and operating activities of financial institutions and their holding companies. The Dodd-Frank Act requires various federal agencies to adopt a broad range of new implementing rules and regulations, and to prepare numerous studies and reports for Congress. The federal agencies are given significant discretion in drafting the implementing rules and regulations, and consequently, many of the details and much of the impacts of the Dodd-Frank Act may not be known for many months or years. Certain provisions of the Dodd-Frank Act are expected to have a near term effect on us. For example, the new law provides that the Office of Thrift Supervision, which is the current primary federal regulator for ESSA Bancorp, will cease to exist one year from the date of the new laws enactment. The Board of Governors of the Federal Reserve System will supervise and regulate all savings and loan holding companies that were formerly regulated by the Office of Thrift Supervision, including ESSA Bancorp. The Office of the Comptroller of the Currency, which is currently the primary federal regulator for national banks, will become the primary federal regulator for federal thrifts. The Dodd-Frank Act creates a new Consumer Financial Protection Bureau with broad powers to supervise and enforce consumer protection laws. The Consumer Financial Protection Bureau has broad rule-making authority for a wide range of consumer protection laws that apply to all banks and savings institutions, including the authority to prohibit unfair, deceptive or abusive acts and practices. The Consumer Financial Protection Bureau has examination and enforcement authority over all banks with more than $10 billion in assets. Banks with $10 billion or less in assets will continue to be examined for compliance with the consumer laws by their primary bank regulators. The Dodd-Frank Act also weakens the federal preemption rules that have been applicable for national banks and federal savings associations, and gives state attorneys general the ability to enforce federal consumer protection laws. The Dodd-Frank Act requires minimum leverage (Tier 1) and risk based capital requirements for bank and savings and loan holding companies that are no less than those applicable to banks, which will exclude certain instruments that previously have been eligible for inclusion by bank holding companies as Tier 1 capital, such as trust preferred securities. Effective one year after the date of enactment is a provision of the Dodd-Frank Act that eliminates the federal prohibitions on paying interest on demand deposits, thus allowing businesses to have interest bearing checking accounts. Depending on competitive responses, this significant change to existing law could have an adverse impact on our interest expense. The Dodd-Frank Act also broadens the base for Federal Deposit Insurance Corporation deposit insurance assessments. Assessments will now be based on the average consolidated total assets less tangible equity capital of a financial institution, rather than deposits. The Dodd-Frank Act also permanently increases the maximum amount of deposit insurance for banks, savings institutions and credit unions to $250,000 per depositor, retroactive to January 1, 2008, and non-interest bearing transaction accounts have unlimited deposit insurance through December 31, 2013. The legislation also increases the required minimum reserve ratio for the Deposit Insurance Fund, from 1.15% to 1.35% of insured deposits, and directs the FDIC to offset the effects of increased assessments on depository institutions with less than $10 billion in assets. The Dodd-Frank Act will require publicly traded companies to give stockholders a non-binding vote on executive compensation and so-called golden parachute payments, and by authorizing the Securities and Exchange Commission to promulgate rules that would allow stockholders to nominate their own candidates using a companys proxy materials. The legislation also directs the Federal Reserve Board to promulgate rules prohibiting excessive compensation paid to bank holding company executives, regardless of whether the company is publicly traded or not. It is difficult to predict at this time what specific impact the Dodd-Frank Act and the yet to be written implementing rules and regulations will have on community banks. However, it is expected that at a minimum they will increase our operating and compliance costs and could increase our interest expense. Increases to the Allowance for Credit Losses May Cause Our Earnings to Decrease. Our customers may not repay their loans according to the original terms, and the collateral securing the payment of those loans may be insufficient to pay any remaining loan balance. In addition, the estimates used to determine the fair value of such loans as of the acquisition date may be inconsistent with the actual performance of the acquired loans. Hence, we may experience significant credit losses, which could have a material adverse effect on our operating results. We make various assumptions and judgments about the collectability of our loan portfolio, including the creditworthiness of our borrowers and the value of the real estate and other assets serving as collateral for the repayment of loans. In determining the amount of the allowance for credit losses, we rely on loan quality reviews, past loss experience, and an evaluation of economic conditions, among other factors. If our assumptions prove to be incorrect, our allowance for credit losses may not be sufficient to cover losses inherent in our loan portfolio, resulting in additions to the allowance. Material additions to the allowance would materially decrease our net income. Our emphasis on the origination of commercial real estate and business loans is one of the more significant factors in evaluating our allowance for credit losses. As we continue to increase the amount of these loans, additional or increased provisions for credit losses may be necessary and as a result would decrease our earnings. Bank regulators periodically review our allowance for credit losses and may require us to increase our provision for credit losses or loan charge-offs. Any increase in our allowance for credit losses or loan charge-offs as required by these regulatory authorities could have a material adverse effect on our results of operations and/or financial condition. Future Changes in Interest Rates Could Reduce Our Profits. 2. the interest expense we pay on our interest-bearing liabilities, such as deposits and borrowings. From September, 2007 through December, 2008, the Federal Reserve Board of Governors decreased its target for the federal funds rate from 5.25% to 0.25%. The federal funds rate has remained at 0.25% since December 2008 and is expected to remain at or around that level for an extended period of time. While these short term market interest rates (which we use as a guide to price our deposits) decreased, longer term market interest rates (which we use as a guide to price our longer term loans) have also decreased but not to the same degree. With the decline in shorter term market interest rates the Companys cost of funds declined. This decline in our cost of funds was initially beneficial to our net interest spread. However, as short term market rates have remained low and longer term interest rates have also declined, the Companys net interest spread decreased from 2.40% for the year ended September 30, 2009 to 2.34% for the year ended September 30, 2010. If market rates remain at these historic lows, there could be further negative pressure exerted on our net interest spread. In addition, changes in interest rates can affect the average life of loans and mortgage-backed and related securities. A reduction in interest rates results in increased prepayments of loans and mortgage-backed and related securities, as borrowers refinance their loans in order to reduce their borrowing costs. This creates reinvestment risk, which is the risk that we may not be able to reinvest prepayments at rates that are comparable to the rates we earned on the prepaid loans or securities. Alternatively, increases in interest rates may decrease loan demand and/or make it more difficult for borrowers to repay adjustable rate loans. Changes in interest rates also affect the current market value of our interest-earning securities portfolio. Generally, the value of securities moves inversely with changes in interest rates. At September 30, 2010, the fair value of our debt securities available for sale totaled $252.3 million. Unrealized net gains on these available for sale securities totaled approximately $5.8 million at September 30, 2010 and are reported as a separate component of stockholders equity. Decreases in the fair value of securities available for sale in future periods would have an adverse effect on stockholders equity. Concentration of loans in our primary market area, which has experienced an economic downturn, may increase the risk of increased nonperforming assets. Our success depends primarily on the general economic conditions in the Pennsylvania counties of Monroe and Northampton, as nearly all of our loans are to customers in these markets. Accordingly, the local economic conditions in this market area have a significant impact on the ability of borrowers to repay loans as well as our ability to originate new loans. As such, a continuation of the decline in real estate values in this market area would also lower the value of the collateral securing loans on properties in this market area. In addition, continued weakening in general economic conditions such as inflation, recession, unemployment or other factors beyond our control could negatively affect our financial results. Continued and sustained deterioration in the housing sector and related markets and prolonged elevated unemployment levels may adversely affect our business and financial results. During 2009 and the beginning of 2010, general economic conditions continued to worsen nationally as well as in our market area. While we did not invest in sub-prime mortgages and related investments, our lending business is tied significantly to the housing market. Declines in home prices, and increases in foreclosures and unemployment levels, have adversely impacted the credit performance of real estate loans, resulting in the write-down of asset values. The continuing housing slump has resulted in reduced demand for the construction of new housing, further declines in home prices, and increased delinquencies on construction, residential and commercial mortgage loans. The ongoing concern about the economy in general has caused many lenders to reduce or cease providing funding to borrowers. These conditions may also cause a further reduction in loan demand, and increases in our non-performing assets, net charge-offs and provisions for loan losses. A worsening of these negative economic conditions could adversely affect our prospects for growth, asset and goodwill valuations and could result in a decrease in our interest income and a material increase in our provision for loan losses. Recent Negative Developments in the Financial Industry and the Domestic and International Credit Markets may Adversely Affect our Operations and Results. Negative developments in the latter half of 2007, during 2008 and continuing through 2010 in the global credit and securitization markets resulted in uncertainty in the financial markets in general with the expectation of the general economic downturn continuing into 2011. Loan portfolio quality has deteriorated at many institutions. In addition, the values of real estate collateral supporting many commercial loans and home mortgages have declined and may continue to decline. Bank and bank holding company stock prices have been negatively affected, as has the ability of banks and bank holding companies to raise capital or borrow in the debt markets. As a result, the potential exists for new federal or state laws and regulations regarding lending and funding practices and liquidity standards, and bank regulatory agencies are expected to be active in responding to concerns and trends identified in examinations, including the expected issuance of many formal enforcement orders. Negative developments in the financial industry and the domestic and international credit markets, and the impact of new legislation in response to those developments, may negatively impact our operations by restricting our business operations, including our ability to originate or sell loans, and adversely impact our financial performance. In addition, these risks could affect the value of our loan portfolio as well as the value of our investment portfolio, which would also negatively affect our financial performance. Our Continued Emphasis On Commercial Real Estate Lending Increases Our Exposure To Increased Lending Risks. Our business strategy centers on continuing our emphasis on commercial real estate lending. We have grown our loan portfolio in recent years with respect to this type of loan and intend to continue to emphasize this type of lending. At September 30, 2010, $78.1 million, or 10.6%, of our total loan portfolio consisted of commercial real estate loans. Loans secured by commercial real estate generally expose a lender to greater risk of non-payment and loss than one- to four-family residential mortgage loans because repayment of the commercial real estate loans often depends on the successful operation of the property and the income stream of the underlying property. Additionally, such loans typically involve larger loan balances to single borrowers or groups of related borrowers compared to one- to four-family residential mortgage loans. Accordingly, an adverse development with respect to one loan or one credit relationship can expose us to greater risk of loss compared to an adverse development with respect to a one- to four-family residential mortgage loan. We seek to minimize these risks through our underwriting policies, which require such loans to be qualified on the basis of the propertys collateral value, net income and debt service ratio; however, there is no assurance that our underwriting policies will protect us from credit-related losses. Strong Competition Within Our Market Areas May Limit Our Growth and Profitability. Economic Conditions May Adversely Affect Our Liquidity and Financial Condition. Recent significant declines in the values of mortgage-backed securities and derivative securities issued by financial institutions, government sponsored entities, and major commercial and investment banks have led to decreased confidence in financial markets among borrowers, lenders, and depositors, as well as disruption and extreme volatility in the capital and credit markets and the failure of some entities in the financial sector. As a result, many lenders and institutional investors have reduced or ceased to provide funding to borrowers. Continued turbulence in the capital and credit markets may adversely affect our liquidity and financial condition and the willingness of certain counterparties and customers to do business with us. We Operate in a Highly Regulated Environment and May Be Adversely Affected by Changes in Laws and Regulations. We are subject to extensive regulation, supervision, and examination by the Office of Thrift Supervision (the OTS), the FDIC and the Pennsylvania Department of Banking. Such regulators govern the activities in which we may engage, primarily for the protection of depositors. These regulatory authorities have extensive discretion in connection with their supervisory and enforcement activities, including the imposition of restrictions on the operation of a bank, the classification of assets by a bank, the imposition of higher capital requirements, and the adequacy of a banks allowance for credit losses. Any change in such regulation and oversight, whether in the form of regulatory policy, regulations, or legislation, could have a material impact on us and our operations. We believe that we are in substantial compliance with applicable federal, state and local laws, rules and regulations. Because our business is highly regulated, the laws, rules and applicable regulations are subject to regular modification and change. There can be no assurance that proposed laws, rules and regulations, or any other laws, rules or regulations, will not be adopted in the future, which could make compliance more difficult or expensive or otherwise adversely affect our business, financial condition or prospects. The Soundness of Other Financial Services Institutions May Adversely Affect Our Credit Risk. We rely on other financial services institutions through trading, clearing, counterparty, and other relationships. We maintain limits and monitor concentration levels of our counterparties as specified in our internal policies. Our reliance on other financial services institutions exposes us to credit risk in the event of default by these institutions or counterparties. These losses could adversely affect our results of operations and financial condition. Any Future FDIC Insurance Premiums or Required Prepayments of Assessments Will Adversely Impact Our Earnings. On May 22, 2009, the FDIC adopted a final rule levying a five basis point special assessment on each insured depository institutions assets minus Tier 1 capital as of June 30, 2009. The special assessment was payable on September 30, 2009. We recorded an expense of $400,000 during the quarter ended June 30, 2009 to reflect the special assessment. In lieu of another special assessment, on September 27, 2009, the FDIC board proposed a requirement that insured institutions prepay their estimated quarterly risk-based assessments for the fourth quarter of 2009, as well as for all of 2010, 2011 and 2012, and, in addition, increased assessment rates on deposit insurance premiums by three basis points effective January 1, 2011. FDIC guidance provides that as of December 31, 2009, and each quarter thereafter, each insured institution will be required to record an expense for its regular quarterly assessment and an offsetting credit to the prepaid assessment until the asset is exhausted. Once the asset is exhausted, the institution would resume paying and accounting for quarterly deposit insurance assessments as it currently does. Any further special assessments that the FDIC levies will be recorded as an expense during the appropriate period. The prepayment of the future premiums, coupled with any future assessments, could have a material adverse effect on our results of operations and/or financial condition. A Substantial Decline in the Value of Our FHLB Common Stock May Adversely Affect Our Financial Condition. We own common stock of the FHLB in order to qualify for membership in the Federal Home Loan Bank system, which enables us to borrow funds under the Federal Home Loan Bank advance program. The carrying value and fair value of our FHLB common stock was $20.7 million as of September 30, 2010. Recent published reports indicate that certain member banks of the Federal Home Loan Bank system may be subject to asset quality risks that could result in materially lower regulatory capital levels. In an extreme situation, it is possible that the capitalization of a Federal Home Loan Bank, including the FHLB, could be substantially diminished or reduced to zero. Consequently, given that there is no market for our FHLB common stock, we believe that there is a risk that our investment could be deemed other than temporarily impaired at some time in the future. If this occurs, it may adversely affect our results of operations and financial condition. If the capitalization of the FHLB is substantially diminished and if it reduces or suspends its dividend, our liquidity may be adversely impaired if we are not able to obtain an alternative source of funding. Recent health care legislation could increase our expenses or require us to pass further costs on to our employees, which could adversely affect our operations, financial condition and earnings. Legislation enacted in 2010 requires companies to provide expanded health care coverage to their employees, such as affordable coverage to part-time employees and coverage to dependent adult children of employees. Companies will also be required to enroll new employees automatically into their health plans. Compliance with these and other new requirements of the health care legislation will increase our employee benefits expense, and may require us to pass these costs on to our employees, which could give us a competitive disadvantage in hiring and retaining qualified employees. The following table provides certain information as of September 30, 2010 with respect to our main office located in Stroudsburg, Pennsylvania, and our seventeen full service branch offices. During the year ended September 30, 2010, the Company opened four new branches. The branches included one free standing branch in Mountainhome, Pennsylvania (Monroe County), two supermarket branches, one in Allentown, Pennsylvania and another in Schnecksville, Pennsylvania (both in Lehigh County) and a supermarket branch in Bethlehem, Pennsylvania (Northampton County). The net book value of our premises, land and equipment was $12.2 million at September 30, 2010. The Company and its subsidiaries are subject to various legal actions arising in the normal course of business. In the opinion of management, the resolution of these legal actions is not expected to have a material adverse effect on the Companys results of operations. Our shares of common stock are traded on the Nasdaq Global Market under the symbol ESSA. The approximate number of holders of record of ESSA Bancorp, Inc.s common stock as of September 30, 2010 was 2,439. Certain shares of ESSA Bancorp, Inc. are held in nominee or street name and accordingly, the number of beneficial owners of such shares is not known or included in the foregoing number. The following tables present quarterly market information for ESSA Bancorp, Inc.s common stock for the periods ended September 30, 2009 and September 30, 2010. The following information was provided by the Nasdaq Stock Market. The Board of Directors has the authority to declare cash dividends on shares of common stock, subject to statutory and regulatory requirements. We began to pay quarterly cash dividends in the third quarter of fiscal 2008. In determining whether and in what amount to pay a cash dividend in the future, the Board will take into account a number of factors, including capital requirements, our consolidated financial condition and results of operations, tax considerations, statutory and regulatory limitations and general economic conditions. No assurances can be given that cash dividends will not be reduced or eliminated in the future. 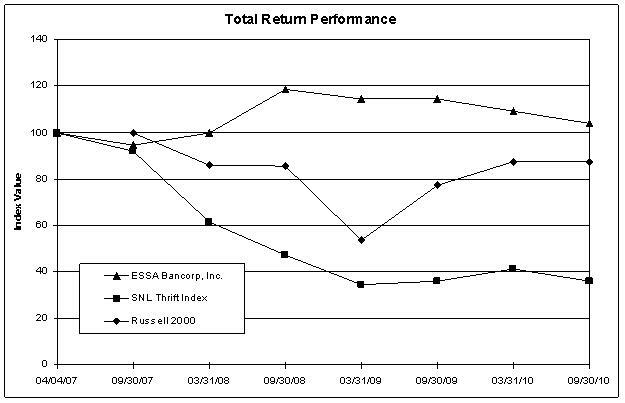 Set forth hereunder is a stock performance graph comparing (a) the cumulative total return on the common stock between April 4, 2007 and September 30, 2010, (b) the cumulative total return on stock included in the SNL Thrift Index over such period, and (c) the cumulative total return on stocks included in the Russell 2000 Index over such period. Cumulative return assumes the reinvestment of dividends, and is expressed in dollars based on an assumed investment of $100. There can be no assurance that the ESSA Bancorp, Inc.s stock performance will continue in the future with the same or similar trend depicted in the graph. ESSA Bancorp, Inc. will not make or endorse any predictions as to future stock performance. The following information is derived from the audited consolidated financial statements of ESSA Bancorp, Inc. For additional information, reference is made to Managements Discussion and Analysis of Financial Condition and Results of Operations and the Consolidated Financial Statements of ESSA Bancorp, Inc. and related notes included elsewhere in this Annual Report. (1) Earnings per share for 2007 are calculated for the period beginning with the Companys date of conversion of April 3, 2007 and are based on a net loss of $(7,289). (1) The interest rate spread represents the difference between the weighted-average yield on a fully tax equivalent basis on interest-earning assets and the weighted-average cost of interest-bearing liabilities for the year. (2) The net interest margin represents net interest income on a fully tax equivalent basis as a percent of average interest-earning assets for the year. (3) The efficiency ratio represents non-interest expense divided by the sum of net interest income and non-interest income. Employing affordable technology to increase profitability and improve customer service. Increasing customer relationships through a continued commitment to service and enhancing products and delivery systems. We will continue to increase customer relationships by focusing on customer satisfaction with regard to service, products, systems and operations. We have upgraded and expanded certain of our facilities, including our corporate center and added additional branches to provide additional capacity to manage future growth and expand our delivery systems. Continuing to transform into a full-service community bank. We continue to transform from a traditional savings association into a full-service community bank. During the last several years, we have begun to offer a wide variety of commercial loans and deposits, as well as trust and brokerage services. Continuing to develop into a high performing financial institution. We will continue to enhance profitability by focusing on increasing non-interest income as well as increasing commercial products, including commercial real estate lending, which often have a higher profit margin than more traditional products. We also will pursue lower-cost commercial deposits as part of this strategy. Remaining within our risk management parameters. We place significant emphasis on risk management and compliance training for all of our directors, officers and employees. We focus on establishing regulatory compliance programs to determine the degree of such compliance and to maintain the trust of our customers and community. Employing cost-effective technology to increase profitability and improve customer service. We will continue to upgrade our technology in an efficient manner. We have implemented new software for marketing purposes and have upgraded both our internal and external communication systems. Continuing our emphasis on commercial real estate lending to improve our overall performance. We intend to continue to emphasize the origination of higher interest rate margin commercial real estate loans as market conditions, regulations and other factors permit. We have expanded our commercial banking capabilities by adding experienced commercial bankers, and enhancing our direct marketing efforts to local businesses. Expanding our banking franchise through branching and acquisitions. We will attempt to use the net proceeds from the 2007 offering, as well as our new stock holding company structure, to expand our market footprint through de novo branching as well as through acquisitions of banks, savings institutions and other financial service providers in our primary market area. We will also consider establishing de novo branches or acquiring financial institutions in contiguous counties. During our second quarter, we completed construction on a new branch in Monroe County. During our third quarter, we entered into leases for two supermarket branches in Lehigh County and one supermarket branch in Northampton County. We will continue to review and assess locations for new branches both within Monroe County and the contiguous counties around Monroe. There can be no assurance that we will be able to consummate any acquisitions or establish any additional new branches. We may explore acquisition opportunities involving other banks and thrifts, and possibly financial service companies, when and as they arise, as a means of supplementing internal growth, filling gaps in our current geographic market area and expanding our customer base, product lines and internal capabilities, although we have no current plans, arrangements or understandings to make any acquisitions. Maintaining the quality of our loan portfolio. Maintaining the quality of our loan portfolio is a key factor in managing our growth. We will continue to use customary risk management techniques, such as independent internal and external loan reviews, risk-focused portfolio credit analysis and field inspections of collateral in overseeing the performance of our loan portfolio. Allowance for Loan Losses. The allowance for loan losses is the estimated amount considered necessary to cover credit losses inherent in the loan portfolio at the balance sheet date. The allowance is established through the provision for loan losses which is charged against income. In determining the allowance for loan losses, management makes significant estimates and has identified this policy as one of our most critical. The methodology for determining the allowance for loan losses is considered a critical accounting policy by management due to the high degree of judgment involved, the subjectivity of the assumptions utilized and the potential for changes in the economic environment that could result in changes to the amount of the recorded allowance for loan losses. As a substantial amount of our loan portfolio is collateralized by real estate, appraisals of the underlying value of property securing loans and discounted cash flow valuations of properties are critical in determining the amount of the allowance required for specific loans. Assumptions for appraisals and discounted cash flow valuations are instrumental in determining the value of properties. Overly optimistic assumptions or negative changes to assumptions could significantly impact the valuation of a property securing a loan and the related allowance determined. The assumptions supporting such appraisals and discounted cash flow valuations are carefully reviewed by management to determine that the resulting values reasonably reflect amounts realizable on the related loans. Management performs a quarterly evaluation of the adequacy of the allowance for loan losses. Consideration is given to a variety of factors in establishing this estimate including, but not limited to, current economic conditions, delinquency statistics, geographic and industry concentrations, the adequacy of the underlying collateral, the financial strength of the borrower, results of internal and external loan reviews and other relevant factors. This evaluation is inherently subjective, as it requires material estimates that may be susceptible to significant revision based on changes in economic and real estate market conditions. remaining loans by type of loan, risk weighting (if applicable) and payment history. We also analyze historical loss experience, delinquency trends, general economic conditions and geographic and industry concentrations. This analysis establishes factors that are applied to the loan groups to determine the amount of the general allocations. Actual loan losses may be significantly more than the allowance for loan losses we have established which could have a material negative effect on our financial results. Other-than-Temporary Investment Security Impairment. Securities are evaluated periodically to determine whether a decline in their value is other-than-temporary. Management utilizes criteria such as the magnitude and duration of the decline, in addition to the reasons underlying the decline, to determine whether the loss in value is other-than-temporary. The term other-than-temporary is not intended to indicate that the decline is permanent, but indicates that the prospect for a near-term recovery of value is not necessarily favorable, or that there is a lack of evidence to support a realizable value equal to or greater than the carrying value of the investment. Once a decline in value is determined to be other-than-temporary, the value of the security is reduced and a corresponding charge to earnings is recognized. Deferred Income Taxes. We use the asset and liability method of accounting for income taxes. Under this method, deferred tax assets and liabilities are recognized for the future tax consequences attributable to differences between the financial statement carrying amounts of existing assets and liabilities and their respective tax bases. Deferred tax assets and liabilities are measured using enacted tax rates expected to apply to taxable income in the years in which those temporary differences are expected to be recovered or settled. If current available information raises doubt as to the realization of the deferred tax assets, a valuation allowance is established. We consider the determination of this valuation allowance to be a critical accounting policy because of the need to exercise significant judgment in evaluating the amount and timing of recognition of deferred tax liabilities and assets, including projections of future taxable income. These judgments and estimates are reviewed on a continual basis as regulatory and business factors change. A valuation allowance for deferred tax assets may be required if the amount of taxes recoverable through loss carryback declines, or if we project lower levels of future taxable income. Such a valuation allowance would be established through a charge to income tax expense which would adversely affect our operating results. Total Assets. Total assets increased $29.9 million, or 2.9%, to $1.07 billion at September 30, 2010, compared to $1.04 billion at September 30, 2009. This increase was primarily due to increases in investment securities available for sale and investment securities held to maturity, offset in part by decreases in interest bearing deposits with institutions and certificates of deposit. Cash and Due from Banks. Cash and due from banks increased $351,000 or 4.9% to $7.5 million at September 30, 2010 from $7.1 million at September 30, 2009. The primary reason for this increase was an increase in the Companys cash balance at the Federal Reserve Bank of Philadelphia and increases in the Companys cash on hand at the Banks branch locations. Both of these cash balances fluctuate based on the customer trends and demands within our branch network. Interest-Bearing Deposits with Other Institutions. Interest-bearing deposits with other institutions decreased $8.1 million, or 70.1%, to $3.4 million at September 30, 2010 from $11.5 million at September 30, 2009. The primary reason for the decrease was a decrease in the Companys interest bearing demand deposit account at the FHLBank Pittsburgh of $8.1 million. The decrease was primarily due to the use of funds to repurchase Company common stock and pay dividends. Investment Securities Available for Sale. Investment securities available for sale increased $34.8 million, or 16.0% to $252.3 million at September 30, 2010 from $217.6 million at September 30, 2009. The increase was due primarily to an increase of $30.7 million in the Companys portfolio of United States government agency securities. The growth in the United States government agency securities was due to an investment strategy focused on shorter duration securities. Investment Securities Held to Maturity. Investment securities held to maturity increased $6.1 million or 90.7% to $12.8 million at September 30, 2010 from $6.7 million at September 30, 2009. The primary reason for this increase was the purchase, during the second quarter, of $10.2 million of mortgage-backed securities issued by United States government sponsored agencies or entities as part of a leverage strategy to take advantage of a steep yield curve. Net Loans. Net loans decreased $2.7 million, or 0.37%, to $730.8 million at September 30, 2010 from $733.6 million at September 30, 2009. The primary reason for the decrease in net loans has been the significant decrease in demand for loans by qualified borrowers. One to four family residential mortgages decreased by $7.7 million to $596.2 million at September 30, 2010 from $603.8 million at September 30, 2009. For the same period, commercial real estate loans increased by $10.0 million to $78.1 million at September 30, 2010 from $68.0 million at September 30, 2009, construction loans outstanding decreased by $405,000 to $1.3 million at September 30, 2010 from $1.7 million at September 30, 2009, and commercial loans increased by $117,000 to $16.6 million at September 30, 2010 from $16.5 million at September 30, 2009. Federal Home Loan Bank Stock. Federal Home Loan Bank stock was unchanged at $20.7 million at September 30, 2010 from September 30, 2009. The Bank is a member of the Federal Home Loan Bank System. As a member, the Bank maintains an investment in the capital stock of the FHLB in an amount not less than 35 basis points of the outstanding member asset value plus 4.6% of its outstanding FHLB borrowings, as calculated throughout the year. FHLB borrowings outstanding at September 30, 2010 were $285.1 million compared to borrowings of $343.6 million at September 30, 2009. Deposits. Deposits increased by $131.6 million, or 32.2%, to $540.4 million at September 30, 2010 from $408.9 million at September 30, 2009. The increase in deposits was primarily due to increases in money market accounts of $10.0 million, savings and club accounts of $1.5 million, brokered certificates of deposit of $48.7 million, non-interest bearing demand accounts of $5.0 million, and retail certificates of deposit of $59.3 million. The increase in brokered certificates was the result of the Companys decision to purchase certificates based on the cost of those certificates compared to other available funding sources. Included in the retail certificates of deposit at September 30, 2010 was an increase of $72.8 million in corporate jumbo certificates. Money market accounts increased in part in response to rate promotions for that product along with customers reinvesting proceeds of certificate of deposit maturities. At September 30, 2010, the Company had $70.6 million of brokered certificates of deposit outstanding. Borrowed Funds. Borrowed funds, short term and other, decreased $88.5 million or 20.2% to $350.1 million at September 30, 2010 from $438.6 million at September 30, 2009. Included in borrowed funds at September 30, 2010 were $65.0 million of repurchase agreements with various financial institution third parties. Except for these borrowings all borrowed funds are from the FHLB. The decrease in borrowed funds was primarily due to the use of cheaper funding sources to replace maturing FHLB borrowings. Stockholders Equity. Stockholders equity decreased by $13.9 million, or 7.5% to $171.6 million at September 30, 2010 from $185.5 million at September 30, 2009. This decrease was primarily the result of stock repurchases of $17.2 million funded by proceeds of investment maturities and the payment of cash dividends of $2.6 million which were partially offset by net income of $4.5 million for the year ending September 30, 2010. Net Income. Net income decreased $2.0 million to $4.5 million for the fiscal year ended September 30, 2010 from $6.6 million for the fiscal year ended September 30, 2009. The decrease was primarily the result of decreases in net interest income and increases in provision for loan losses and non-interest expense. These decreases were partially offset by increases in non-interest income. Net Interest Income. Net interest income decreased by $1.0 million, or 3.6%, to $28.0 million for fiscal year 2010 from $29.0 million for fiscal year 2009. The decrease was primarily attributable to a decrease of six basis points in the interest rate spread to 2.34% for fiscal year 2010 from 2.40% for fiscal year 2009, and a decrease in net average interest-earning assets of $9.5 million. Interest Income. Interest income decreased $3.5 million or 6.6% to $49.3 million for fiscal year 2010 from $52.7 million for fiscal year 2009. The decrease resulted from a 44 basis point decrease in the overall yield on interest earning assets to 4.91% for fiscal year 2010 from 5.35% for fiscal year 2009 which decreased interest income by $4.2 million. This decrease was partially offset by a $17.4 million increase in average interest earning assets which had the effect of increasing interest income by $725,000. The average balance of loans during 2010 increased $2.1 million over the average balance during 2009, along with increases in the average balance of investment securities of $8.7 million and in mortgage-backed securities of $1.6 million. In addition, average Federal Home Loan Bank stock increased $292,000 and the average balance of other interest earning assets increased $4.6 million. The primary reason for the increase in investment securities was the investment of deposit and loan proceeds in excess of those needed to fund loan growth. As a member of the FHLB system, the Bank maintains an investment in the capital stock of the FHLB in an amount not less than 45 basis points of the outstanding FHLB member asset value plus 4.6% of its outstanding FHLB borrowings, as calculated throughout the year. On December 23, 2008, the FHLB notified its members, including the Company, that it was suspending the payment of dividends on its capital stock and the repurchase of excess capital stock until further notice. The increase in average other interest earning assets was the result of an increase in the average balance of interest earning deposits held by the Company in its FHLB demand account of $4.6 million. The average yield on loans decreased to 5.51% for the fiscal year 2010, from 5.76% for the fiscal year 2009. The average yields on investment securities decreased to 2.72% from 3.89% and the average yields on mortgage backed securities decreased to 3.97% from 4.77% for the 2010 and 2009 periods, respectively. Interest Expense. Interest expense decreased $2.4 million, or 10.3% to $21.3 million for fiscal year 2010 from $23.7 million for fiscal year 2009. The decrease resulted from a 38 basis point decrease in the overall cost of interest-bearing liabilities to 2.57% for fiscal 2010 from 2.95% for fiscal 2009 which decreased interest expense by $2.4 million. A $26.9 million increase in average interest-bearing liabilities had the effect of decreasing interest expense by $56,000 as borrowed funds matured and were replaced by lower cost alternatives. Average savings and club accounts increased by $4.0 million, average NOW accounts increased $1.5 million, average money market accounts increased $20.7 million and average certificates of deposit increased $42.5 million. For fiscal 2010, average borrowed funds decreased $41.9 million over 2009. The cost of money market accounts decreased to 1.07% for fiscal year 2010 from 1.68% for fiscal year 2009. The cost of certificates of deposit decreased to 2.49% from 3.26% and the cost of borrowed funds decreased to 3.78% from 3.85% for fiscal 2010 and 2009, respectively. Provision for Loan Losses. ESSA Bancorp, Inc. establishes provisions for loan losses, which are charged to earnings, at a level necessary to absorb known and inherent losses that are both probable and reasonably estimable at the date of the financial statements. In evaluating the level of the allowance for loan losses, management considers historical loss experience, the types of loans and the amount of loans in the loan portfolio, adverse situations that may affect the borrowers ability to repay, the estimated value of any underlying collateral, peer group information and prevailing economic conditions. This evaluation is inherently subjective as it requires estimates that are susceptible to significant revision as more information becomes available or as future events occur. After an evaluation of these factors, management made a provision of $2.2 million for fiscal year 2010 compared to a $1.5 million provision for the 2009 fiscal year. At September 30, 2010, the Company had 12 commercial loan relationships whose loans were judged by management to be impaired. Of these twelve relationships, ten commercial real estate relationships with combined outstanding loans of $2.9 million had an allocation of the allowance for loan loss amounting to $86,000. Two commercial business relationships with combined loans of $52,000 had an allocation of the allowance for loan loss amounting to $47,000. These specific allowance allocations were also considered in the Companys evaluation for its provision for loan losses for the fiscal year ended September 30, 2010. The allowance for loan losses was $7.4 million or 1.01% of loans outstanding at September 30, 2010, compared to $5.8 million, or 0.79% of loans outstanding at September 30, 2009.
depends on the successful operation of the property and the income stream of the underlying property. Additionally, such loans typically involve larger loan balances to single borrowers or groups of related borrowers compared to one-to-four family residential mortgage loans. Accordingly, an adverse development with respect to one loan or one credit relationship can expose us to greater risk of loss compared to an adverse development with respect to a one-to-four family residential mortgage loan. Although we believe that we use the best information available to establish the allowance for loan losses, future additions to the allowance may be necessary, based on estimates that are susceptible to change as a result of changes in economic conditions and other factors. In addition, the Office of Thrift Supervision, as an integral part of its examination process, will periodically review our allowance for loan losses. This agency may require us to recognize adjustments to the allowance, based on its judgments about information available to it at the time of its examination. Non-Interest Income. Non-interest income increased $980,000 or 17.1%, to $6.7 million for the year ended September 30, 2010, from $5.7 million for the comparable 2009 period. This increase was primarily due to increases in gain on sale of investments, net of $1.0 million for fiscal 2010 compared to fiscal 2009. Non-Interest Expense. Non-interest expense increased $2.0 million, or 8.4%, to $26.1 million for fiscal year 2010 from $24.1 million for the comparable period in 2009. The primary reasons for the increase were increases in compensation and employee benefits of $404,000, FDIC premiums of $139,000 and loss on foreclosed real estate of $1.2 million. Compensation and employee benefits increased primarily as a result of hiring additional employees to staff the Companys branch expansion. FDIC premiums increased as a result of increases in the assessment rates of FDIC insurance as well as deposit growth. Loss on foreclosed real estate increased because the Company incurred a $1.2 million write down in the first fiscal quarter in 2010 related to a single property in the Banks foreclosed real estate portfolio. Income Taxes. Income tax expense of $1.8 million was recognized for fiscal year 2010 compared to an income tax expense of $2.6 million recognized for fiscal year 2009. The decrease was primarily the result of a decrease of $2.8 million in income before taxes for the year ended September 30, 2010 compared to 2009. Net Income. Net income increased $479,000 to $6.6 million for the fiscal year ended September 30, 2009 from $6.1 million for the fiscal year ended September 30, 2008. The increase was primarily the result of increases in net interest income and non-interest income, and a one-time tax benefit related to the write down of Fannie Mae preferred stock. These increases were partially offset by increases in non-interest expense. Net Interest Income. Net interest income increased by $2.6 million, or 9.7%, to $29.0 million for fiscal year 2009 from $26.4 million for fiscal year 2008. The increase was primarily attributable to an increase of 31 basis points in the interest rate spread to 2.40% for fiscal year 2009 from 2.09% for fiscal year 2008, which was partially offset by a decrease in net average interest-earning assets of $19.5 million. outstanding unused FHLB borrowing capacity or 1/20 of its outstanding FHLB borrowings, whichever is greater, as calculated throughout the year. On December 23, 2008, the FHLB notified its members, including the Company, that it was suspending the payment of dividends on its capital stock and the repurchase of excess capital stock until further notice. The decrease in average other interest earning assets was the result of a decrease in the average balance of interest earning deposits held by the Company in its FHLB demand account of $2.4 million. The average yield on loans decreased to 5.76% for the fiscal year 2009, from 6.03% for the fiscal year 2008. The average yields on investment securities decreased to 3.89% from 4.77% and the average yields on mortgage backed securities decreased to 4.77% from 4.93% for the 2009 and 2008 periods, respectively. Interest Expense. Interest expense decreased $1.9 million, or 7.4% to $23.7 million for fiscal year 2009 from $25.6 million for fiscal year 2008. The decrease resulted from an $89.1 million increase in average interest-bearing liabilities, which had the effect of increasing interest expense by $1.0 million. This increase was more than offset by a 64 basis point decrease in the overall cost of interest-bearing liabilities to 2.95% for fiscal 2009 from 3.59% for fiscal 2008, which decreased interest expense by $2.9 million. Average savings and club accounts increased by $518,000, average NOW accounts decreased $811,000, average money market accounts increased $36.8 million and average certificates of deposit decreased $14.4 million. For fiscal 2009, average borrowed funds increased $67.0 million over 2008. The cost of money market accounts decreased to 1.68% for fiscal year 2009 from 2.90% for fiscal year 2008. The cost of certificates of deposit decreased to 3.26% from 4.19% and the cost of borrowed funds decreased to 3.85% from 4.48% for fiscal 2009 and 2008, respectively. Provision for Loan Losses. ESSA Bancorp, Inc. establishes provisions for loan losses, which are charged to earnings, at a level necessary to absorb known and inherent losses that are both probable and reasonably estimable at the date of the financial statements. In evaluating the level of the allowance for loan losses, management considers historical loss experience, the types of loans and the amount of loans in the loan portfolio, adverse situations that may affect the borrowers ability to repay, the estimated value of any underlying collateral, peer group information and prevailing economic conditions. This evaluation is inherently subjective as it requires estimates that are susceptible to significant revision as more information becomes available or as future events occur. After an evaluation of these factors, management made a provision of $1.5 million for fiscal year 2009 compared to a $900,000 provision for the 2008 fiscal year. At September 30, 2009 the Company had six commercial loan relationships whose loans were judged by management to be impaired. Four commercial real estate relationships with combined outstanding loans of $760,000 were allocated a specific loan loss allowance of $104,000. Two commercial business relationships with combined loans of $122,000 were allocated a specific loan loss allowance of $44,000. These specific allowance allocations were also considered in the Companys evaluation for its provision for loan losses for the fiscal year ended September 30, 2009. The allowance for loan losses was $5.8 million or 0.79% of loans outstanding at September 30, 2009, compared to $4.9 million, or 0.69% of loans outstanding at September 30, 2008. Determining the amount of the allowance for loan losses necessarily involves a high degree of judgment. Management reviews the level of the allowance on a quarterly basis, and establishes the provision for loan losses based on the factors set forth in the preceding paragraph. Historically, the Banks loan portfolio has consisted primarily of one-to four-family residential mortgage loans. However, our current business plan calls for increases in commercial real estate loan originations. As management evaluates the allowance for loan losses, the increased risk associated with larger non-homogenous commercial real estate may result in large additions to the allowance for loan losses in future periods. Loans secured by commercial real estate generally expose a lender to greater risk of non-payment and loss than one-to-four family residential mortgage loans because repayment of the loans often depends on the successful operation of the property and the income stream of the underlying property. Additionally, such loans typically involve larger loan balances to single borrowers or groups of related borrowers compared to one-to-four family residential mortgage loans. Accordingly, an adverse development with respect to one loan or one credit relationship can expose us to greater risk of loss compared to an adverse development with respect to a one-to-four family residential mortgage loan. Non-Interest Income. Non-interest income increased $925,000 or 19.3%, to $5.7 million for the year ended September 30, 2009, from $4.8 million for the comparable 2008 period. The increase was primarily attributable to an other-than temporary-impairment (OTTI) pretax charge taken in September 2008 of $802 related to Fannie Mae preferred stock the Company owns compared to a $68,000 OTTI charge taken in fiscal 2009. Excluding the one time charges, noninterest income increased $191,000, or 3.4% for the year ended September 30, 2009, compared to the year ended September 30, 2008. This increase was primarily due to increases in gain on sale of loans, net of $430,000 and gain on sale of investments, net of $178,000 which were partially offset by decreases in service fees on deposit accounts of $299,000 for fiscal 2009 compared to fiscal 2008. Non-Interest Expense. Non-interest expense increased $2.9 million, or 13.8%, to $24.1 million for fiscal year 2009 from $21.2 million for the comparable period in 2008. The primary reasons for the increase were increases in compensation and employee benefits of $1.9 million, FDIC premiums of $634,000 and other noninterest expense of $288,000. Compensation and employee benefits increased primarily as a result of an increase of $1.4 million for the year ended September 30, 2009, related to the Companys equity incentive plan. FDIC premiums increased as a result of a special assessment of $400,000 along with increases in the quarterly regular FDIC assessment. Other noninterest expense increased primarily as a result of an increase in foreclosed real estate related expenses of $232,000. Income Taxes. Income tax expense of $2.6 million was recognized for fiscal year 2009 compared to an income tax expense of $3.1 million recognized for fiscal year 2008. The decrease was primarily the result of a one-time tax benefit of $317,000 related to the Companys other than temporary impairment (OTTI) charge taken in the previous year. The OTTI charge related to Fannie Mae perpetual preferred stock held in the Companys available for sale portfolio. Average Balances and Yields. The following table sets forth average balance sheets, average yields and costs, and certain other information for the periods indicated. All average balances are monthly average balances. The yields set forth below include the effect of deferred fees and discounts and premiums that are amortized or accreted to interest income.